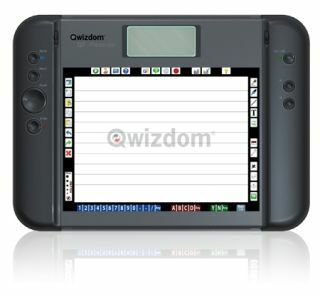 The Qwizdom Q7 Tablet combines RF technology, presenter controls, and response-system interactivity. Teachers can use this as they would any other interactive tablet, but if they are using the Qwizdom student-response system, they can enter a question into the Q7 tablet on the fly and see the statistics on that question on the tablet’s built-in LCD screen. Pros: The tablet use RF to communicate with a computer and the RF session is specific to each tablet, so no cross communication can take place between tablets. The tablet has a nice ergonomic design. The keyboard template is built right into the top of the tablet. The buttons are organized into logical function groups (all drawing buttons are together, all Qwizdom buttons are together, etc). The tablet is customizable for use with any software application and has a large backlit LCD that can show speaker notes and student response data. The RF sender for the computer stores in the back of the tablet. The tablet can recharge using a USB port on computer. Cons: The software will not work with tablets from competitors. The premium subscription is the only way to get all the state-standard curriculum material. As of this issue’s publication date, material recorded with the Q7 could not be placed on a Web page and played back later, but the company says this feature will be available in the fall of 2009; it applies only to Live Editor files. Overall evaluation: If a school uses the Qwizdom student-response system, this is an excellent product for it to purchase.